I don’t know what he was doing there. He reminded me of a much-beloved cat waiting for its owner to return. Perhaps Mr. Bear had been abandoned. The garter stitch around his girth is broken, like he’s been in a scrap. I was tempted to take him home and administer some TLC. If he’s still there in the next few days, I may well steal him away, poor thing! I’ve never been a big fan of Fair Isle and other stranded knitting. For some reason, the ‘floats’ on the reverse side put me off. But I really enjoy Kate Davies’ blog and have been inspired by some of her designs to give the technique a go. Yesterday, I took part in Juju Vail’s Fair Isle workshop at Loop down here in London. It was an all day event and by 5pm, my mind was spinning like a whirligig beetle. We covered a lot, so there is much to practise in order to fix processes in my muscle memory. To start with, there was magic loop knitting, then continental knitting, then the Fair Isle method, and to round it all off, a look at steeking. Phew! I have to say, I’m not very fond of this magic loop malarkey. It seems very faffy, and all that extra length of cable doesn’t half get itself in the way. Annoying! But I’m not giving up on it just yet, and the Fair Isle itself was not as tricky as you might think. 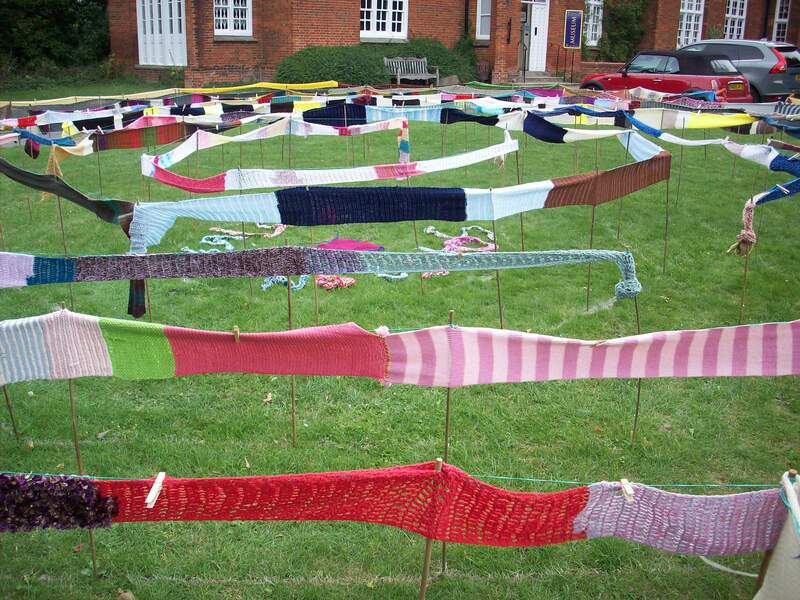 If you’re new to stranded knitting and live in London – or not too much further afield (like America! One woman on the workshop was from “the left side” of the States, and was in the UK for as much holiday crafting as she could squeeze in) – I recommend a workshop with Juju. She’s dynamic, patient, encouraging and positive.. as all good teachers are! As for those Fair Isle patterns by Kate Davies that I’ve idly had my eye on for a while.. I’m that little bit closer to being able to make one. But there is a queue. Isn’t there always?! For the first time in several years (and quite possibly since I started my yarn adventures), I didn’t knit or crochet any gifts for Xmas. I’ve been beavering away on an all-consuming design. I was, however, the grateful recipient of a couple of presents that were either knitted or relating to the craft: one was a bright orange blanket, being put to good use already; the other, a set of blocking mats, which will be very useful when I finish the lacy project I’m working on. Did anyone (in the UK) watch the adaptation of Agatha Christie’s And Then There Were None? 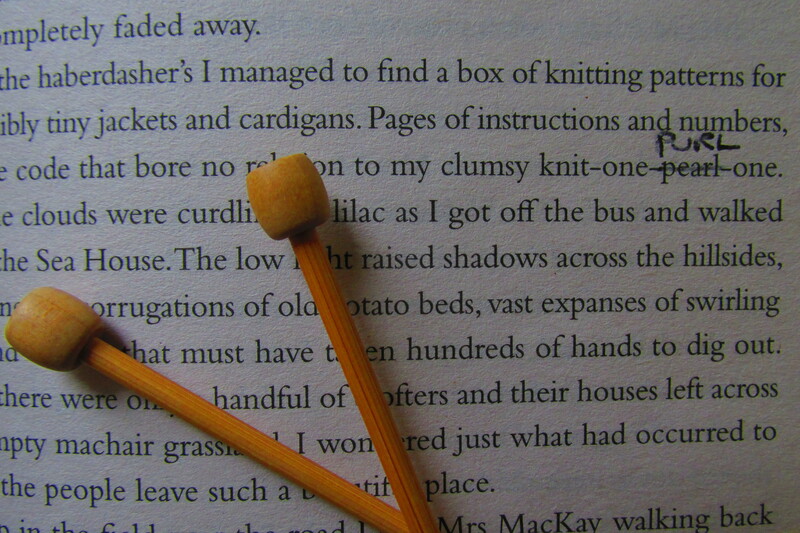 Death by knitting needle is a novel, but plausible, way of killing someone off. Move over, Xena: Warrior Princess! I don’t think crochet hooks would be quite so effective! All that’s left to say is: Happy New Year! If 2015 hasn’t gone well for you, I hope 2016 is better. And if you’ve had a fab time this year, may it continue next year! 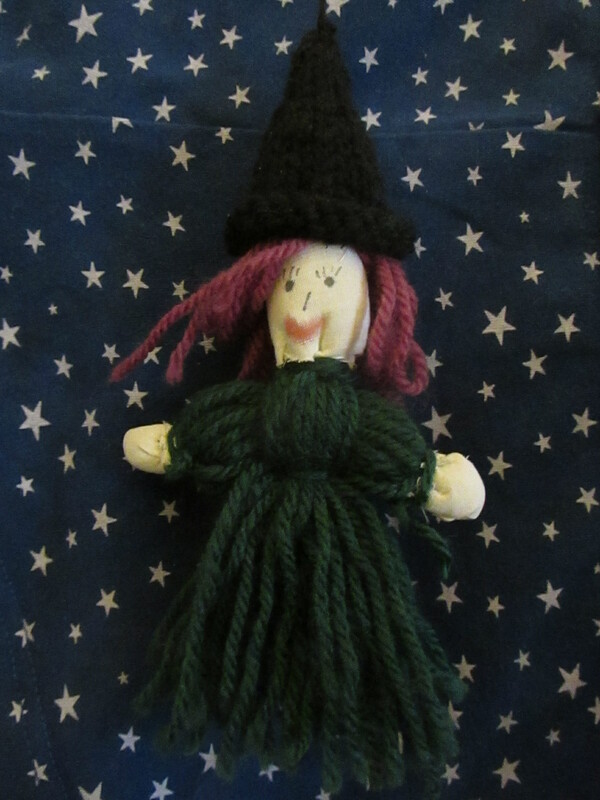 Seeing as it is Halloween, I thought I’d show off a woolly witch I’ve had for.. ooh, 20 years or so. My friend who started me off on my yarn-mania made it for me – only the hat is knitted – and it hangs from my cupboard door. All year around. Oh yes, this witch is not just for Halloween! Not sure I would go quite that far …would you? Picture this: it’s the height of summer, the sky is dreary, and you’re lost in the coils of a maze. 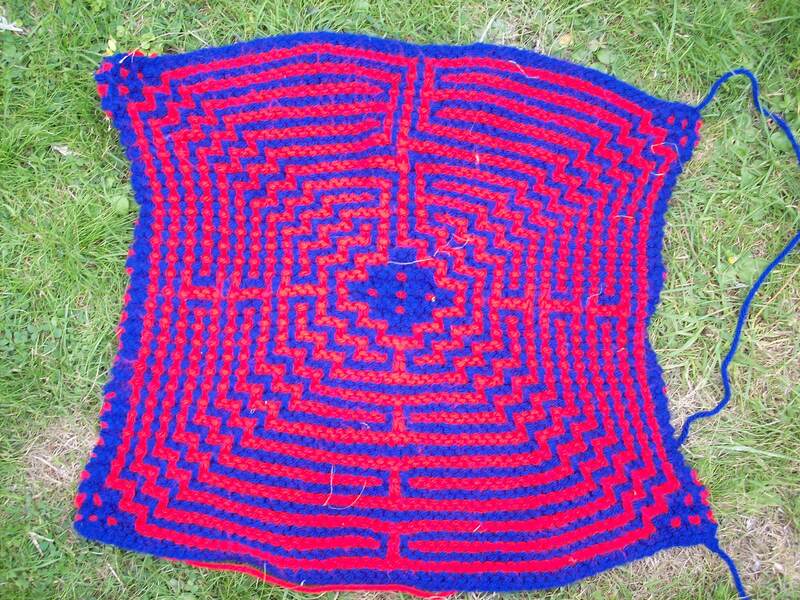 A knitted maze. This was the second Saffron Walden Maze Festival, a celebration inspired by the town’s two historic mazes – one, an ancient turf labyrinth, the other a nineteenth century hedge puzzle. Is there a difference between a labyrinth and a maze? The two terms are often used interchangeably but they are actually distinct things. Labyrinths came first, dating back at least four thousand years, and are based on a unicursal design with a single path to the centre. Mazes are far more recent, appearing about five hundred years ago, and are challenges with dead-ends to confuse and frustrate. Undoubtedly the most famous labyrinth story is that of the slaying of the Minotaur, a beast who periodically required human sacrifice. The hero, Theseus, managed to slay this bull-headed monster, finding his way back along the contorted path using yarn given to him by Ariadne, which he’d trailed behind him on his inward journey. Any clever-clogs amongst us may well be asking why anyone would need such assistance if there was just a single route. True, but I wonder if any of the victims destined to be gobbled down by the Minotaur would’ve known this. When confronted with a tortuous path, no map, and in fear of one’s life, really, how logical would anyone be?? The knitted maze I meandered was a maze in the proper sense. It occurred to me that this was an interesting inversion of the Minotaur legend, the yarn becoming the trap rather than an aid to escape. It was an easy enough maze to traverse, even for the likes of me (I’ve been known to get lost in mazes even with a map in hand!) It was no more than hip-high, with lengths of knitted and crocheted pieces sewn together and pegged onto twine strung between bamboo canes. It brought to mind Dr. Who’s scarf if that were to be hung out to dry after laundering. At the centre was another yarn maze, a so-called ‘finger maze’ to be followed with fingertips, worked in eye-boggling colours, the red leaping out of the blue. 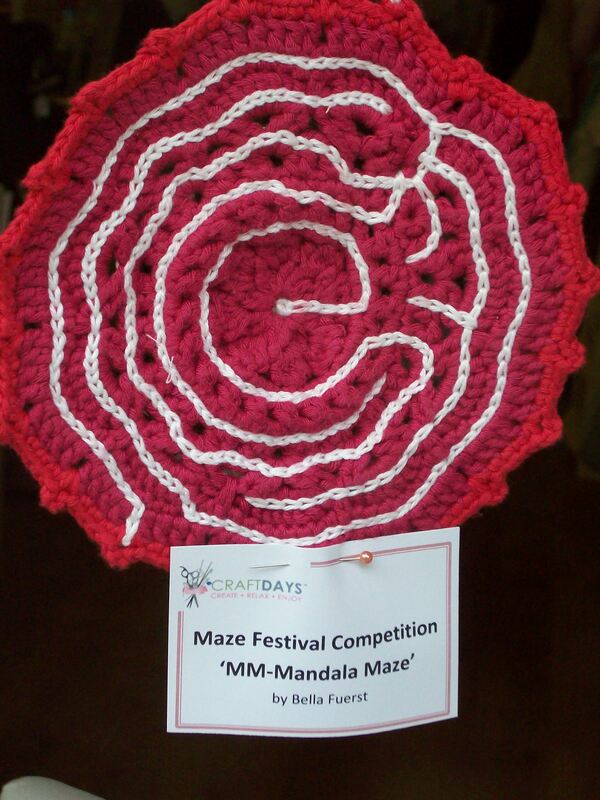 Other textile mazes could be found on display at the shop Craft Days, and were the best entries of a competition. 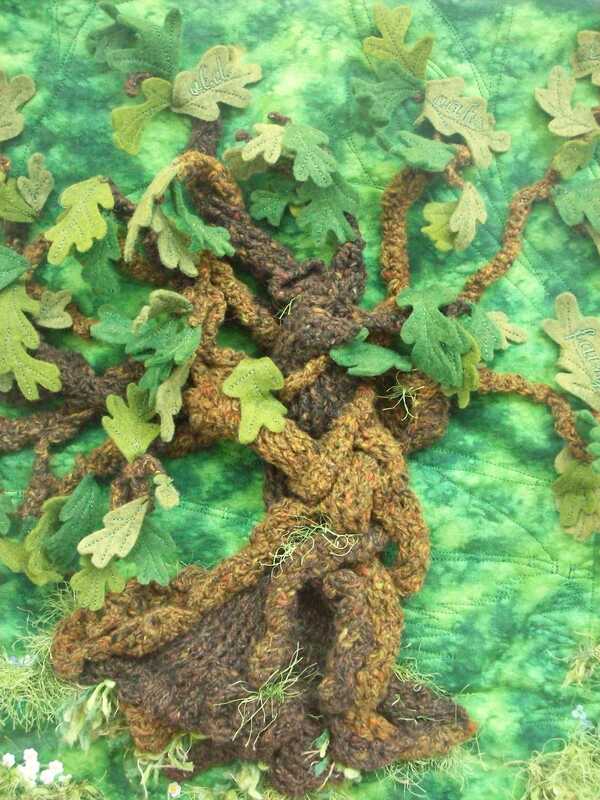 One which brought a smile to my face was titled ‘Purple Haze Maze’ but my favourite was the winning entry: ‘Old Wise Oak’ by Ruth Pickering. It had no obvious maze but the tree was gnarled and twisted in a labyrinthine tangle of sinews often seen in ancient trees. Another was titled ‘MM – Mandala Maze’ by Bella Fuerst, a crocheted circle with a maze traced into it using surface stitches. I suppose the most frequent maze that all knitters and hook workers encounter is the ordinary ball of wool. Just think of the tangle that we all get into at some point – a labyrinth of yarn turning each of us into a monster at the centre!